Whirligigs Party Co: Congratulations to a very special Giveaway Winner! Congratulations to a very special Giveaway Winner! 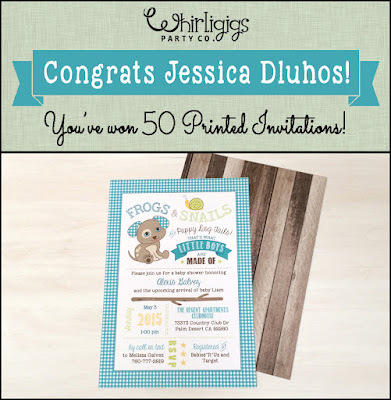 A double congratulations are in order for Jessica Dluhos!! She's the winner of the 50 Printed Invitations Giveaway. Jessica is an Instagram follower, who commented on Instagram, saying that if she won she would love to use her invites for her second little's sip and see. That was Saturday. On Monday, her Instagram page says that her water broke before the scheduled C-section and she welcomed her second child! How exciting and serendipitous! To determine the winner of this giveaway I compiled the list of entries from this blog and Instagram pages. Since there were less than 12 entries, I rolled the dice to find a winner! The dice read #3... and Jessica was the winner! So... Double Congrats!! And welcome new baby Dluhos! !